I was walking down the street, thinking and worrying about the outcome of something. I don’t quite remember what. There some paramedics across the street at a restaurant wheeling a person into the back of an ambulance. I did not pay it much attention because what I was worrying about seemed more important. I must have just started thinking positive about the situation because when an old woman’s voice said as I passed a bench, “You never know what’s going may happen,” I was filled with joy about the positive things that can take place that I can not even imagine with my worrisome mind. I turned to look at her, smiled and said with deep sincerity, “Thank you.” But instead of what I was expecting, an old woman reading my mind and filling me with the wisdom I needed in the moment, I saw a frail old lady filled with worry herself. My joy sank. She was watching the scene across the street, staring her own mortality right in the face. She said to me, “One minute you might just be sitting there, enjoying lunch and the next minute this …” she motioned to the ambulance. I said, something back to her, perhaps a little insensitive, “You never know what good may happen,” attempting to give some of the unintended wisdom she gave to me back to her. I don’t think it worked. She just shook her head with sadness in her eyes, “You never know what’s going to happen.” I walked on, a little later regretting I did not stay with her a little longer. This entry was posted in Short Writings on August 13, 2013 by jligda. Tonight I was inducted into Capitol Speakers Toastmasters Club of Benicia, CA, Club #2080 District D57. I joined Toastmasters so I can get used to public speaking with intention of leading educational webinars thus adding another stream of revenue to my business. I had the role of Wordmaster for tonight’s meeting. The Wordmaster chooses a word for the meeting, introduces it to the group and counts the number of times it is used throughout the meeting. It is designed to help improved the vocabulary of the members of the meeting. I was compelled* to do the Wordmaster role at the last meeting when my friend & mentor, encouraged me to do it. I was planning to volunteer for the timer role as it seemed easier. I would not have to get up in front of the group as the timer. But there I was being encouraged to be the Wordmaster before I had a chance to volunteer as timer. I was nervous before presenting the word to the group. When I was introduced, I walked up to the lectern and began. I didn’t like being nervous. I wanted to be more relaxed, natural and in the moment. I had a stack of papers in my hand with the word and it’s definition, one to hand out to each of the group. I could see as I looked at my hands that they were shaking a little. I kept my cool and presented the word. I even used it a few times myself adding a little humor. As I was finished the Toastmaster (leading this part of the meeting), instructed me to write the word on the board. Yeah, right, my hands were shaking. I took a deep breath and wrote the word as best I could with my shaking hands. “Someone gave me a vibrating pen,” I brought attention to it and made them laugh. During the break my friend came up to me and with a surprised voice said, “Were you nervous?” I told him I was. He said I didn’t appear to be at all. This made me feel a little better. It’s one thing to feel nervous, but then if I start feeling self-conscious about being nervous, that adds more complexity to the difficulty of public speaking. This entry was posted in Toastmasters on August 1, 2013 by jligda. … are still floating in the living room. One of them disappeared. One day I notice the “Way to Go” balloon was gone. I asked mom. We stood there looking … only 3 balloons. She didn’t know what happened to it. I just figured it deflated, she threw it away and forgot about it, so I just let it go. Yesterday we were pulling out of the driveway to run errands when suddenly she got excited, “Oh look there’s the ‘way to go’.” I didn’t know what she was talking about. “Is that a type of flower?” I questioned and searched the database of my mind for a memory of a “way to go” flower or plant … you know, like a “forget me not?” There was none. “Look over your right shoulder up in that yard,” she said. I turned and there it was, the “Way to Go” balloon tied to the neighbor’s bushes floating there informing the entire neighborhood that they did a good job. I thought back to the day before when we had both the rear door and the front door open, allowing that warm breeze to flow through the house thus airing it out but also allowing balloons, not securely fashioned to the edge of the carpet like the other were, to wander on out the front door and explore as no other balloon before it ever had. Still weighted down, it did not suffer a fate of ascending beyond the vision of people to see, all alone in the sky. It must have just scurried across the street, where the neighbors found it and decided to display it to the passerbys, “Way to Go,” they all can all celebrate in their victories of the day. This entry was posted in Short Writings on July 16, 2013 by jligda. The event started with the opening ceremony in Corte Madera. I was a flag bearer in the ceremony carrying the “My Mother” honor flag. When the spokesperson for the event started the walk by marching off stage and down the center isle, the flag bearers followed and that was it. The walk had started, I following the spokesperson with the other flag bearers and 400 other walkers behind. As I passed the opening chute, my badge was scanned to put me in the computer as started and they handed me a “route card.” I was surprised the route card did not have the route on it at all, just the mileage to each pit stop, and lunch and the various designated cheering spots. “Where do we go?” I thought to myself. It wasn’t much of an issue because there were walkers in front of me. I could just follow them. Soon it became clear that I was just to follow the arrows at each intersection. There was also a security volunteer at these intersections to point the way. Not knowing the route created a guessing game for me as to where we were going to walk. This was kind of fun and surprising. The downside was that I could not contact friends along the way to let them know where I would be. Right away I started talking to another walker and walked with her the first few miles to the first pit spot. She was a veteran walker, having walked in nine 3-Day events. I learned a lot for her. At the pit stop she said, “Nice walking with you,” and we parted ways. I started to understand how this worked. You walk with people for a while and then move on, usually at the pit stops. So the day went, sometimes I walked alone, sometimes with other people, getting to know them and hear their stories. On this first day, the hardest part was between mile 5 and 9 as I was starting to question myself, “What is this all about?” I could feel the blisters starting to form on my feet and I was thinking about the numbers of miles and time I still had ahead of me. I felt depressed. Wasn’t there something better I could be doing? At the mile nine pit stop I doctored my feet with Moleskin and fueled up. Lunch was at mile 15, just 6 miles ahead. We had the familiar route through the Mill Valley bike path and Sausalito that I had biked many times. As I drew nearer to lunch I picked up my pace to what I came to know as my “lunch gait.” This also came with much enthusiasm. After lunch we crossed the Golden Gate Bridge and into the Presidio where camp was. The last two miles, once across the bridge, was also tough. My feet were sore from all the pounding and with each step they were being pounded a little more. I’m sure there was a mental affect as well, know I was so close, I’m sure my mind was finishing ahead of me. I was happy to finish, but then had to set up my tent in the cold windy weather that we were faced with. A volunteer helped me, after which I climbed in my tent and fell asleep for a short nap. When I awoke I explored camp. I found the showers and took one, ate, and discovered the massage chairs that Bank of America had set up for us. I relaxed in one for about 20 minutes. The rest of the evening I relaxed in the dining tent where they had a show for us. I was back in my tent at 8 PM where I fell asleep. The next morning I prepared myself for the 22-mile walk that we had ahead of us and headed to breakfast. I have to admit the 22 miles seemed daunting so I was a bit nervous. The standard questions we seem to ask each other, “Is this your first walk?” and “What is your inspiration to walk?” From there the rest of the conversation can unfold … of not. Like myself it was Jody’s first walk. She told me the story of her month passing away last year after a battle with breast cancer. The first part of the story was so similar to my own mother’s; a small lump was found that had spread to the lymph nodes. Yet in her mom’s case, after it was removed it came back all over her body (stage 4 breast cancer). “It just a question of ‘how long,’ after that,” she said to me. This was sombering, as I thought of my mom. The doctors told us, with the estrogen blockers that mom was taking that there was an 11% chance the cancer would return stage four, like Jody’s mom. The doctors say, at that point, that there is very little they can do. Jody lost her mom. The future has yet to unfold with mine. We try to increase her odds by focusing on a better diet, but that is not always easy. Soon Jody’s sister-in-law, Lynn, joined us. I liked the two of them. I returned to my tent to make my final preparations for the day and then joined the crowd waiting for the walk to start. There was Jody & Lynn so I stayed with them as we walked. I walked with them most of the day. We had a nice time laughing and telling stories. They were from out of town so I became their tour guide showing them the sights as we passed them. It was around mile 15, after lunch as we were walking down the Great Highway that it hit all 3 of us at the same time, tired, sore feet. We started dragging a bit, yet we still managed to joke and laugh. One of our ongoing jokes for the day was to try to extend the walk in our minds two miles because the last two miles is always seems to be the worst. If we extended the walk in our minds two miles then we would “trick” ourselves into not finishing mentally before the end. But, as Lynn said, “That trick has gone to hell,” as we were already miserable at mile 15 with 7 left to go. We just had to plug away. We circle up the hill by the Cliff house and through the trails at Lands End. That was when my left shin started really hurting, shin splints, I thought. Also I could feel my left calf tightening up. I didn’t think I would be able to finish. Jody said something to me that really brought home the purpose of the entire event, she said, “I think no matter what, I would finish. It doesn’t matter about the pain. I just would have to think of my mom and what she went through to realize the pain is hardly anything.” True and that’s is the point. We are intentionally choosing to suffer to honor those that do not have the choice. It is a small token of relating with them and hopefully bringing awareness to others with our sacrifice. Still there is a fine line between pushing through the pain, accepting the suffering and damaging one’s self. I was not sure where that line was with me. I made it to the next pit stop and visited the medical tent. They did not impress me. They said there was not much they could do. They could give me ibuprofen and some ice rub to put on it. They recommended when I get back to camp, still a few miles away, that I visit “sports medicine.” I accepted what they had to offer. After a while I felt better, but was aware of the fact that I was just masking the pain. I walked on gingerly as if it was still there. Back at camp I ate, showered and spend about 15 minutes in the massage chair before visiting the medical tent. I had to fill out an intake form, which made me realize this was a serious set up. It was not just a bunch of amateurs volunteering for an event. They had chiropractic on one side, massage and taping on the other. In the tent next door they were tending to people’s blisters. I expected to go to the massage side where they would work on my calf and tape my shin, but they directed me to the chiropractic side. I explained the issue and he worked on my foot a bit. After a few adjustments I could feel the calf relax. The pain in my shin went away. I still had pain in my ankle, however. He told me if it didn’t go away in the morning to come back before the walk. They would be there at 6 AM. Overall I felt good and confident with them and happy about it. As I left the tent I was greeted with my mom, father and brother who had come to visit. It was nice to see them. We went into the dining tent and visited for about an hour before they grew tired of the cold and wind and went home. While the dining tent was protected from the wind, it was still cold and we could hear the wind rattling the tent and howling outside. The next morning I still had the pain in my ankle. I was at the med tent right at 6 AM when they opened. He adjusted my foot one more time and then taped it. He explained to me that because I was walking on an injury I was favoring one side of the foot over the other, thus creating an imbalance in the muscles. The tape would help make up for this imbalance. He had me walk around. The pain was gone! Overall I felt enthusiastic about the day. The bulk of the walk was over. We had only 14 miles to go today. While I knew most of that would be on hills and concrete (as opposed to yesterday, where about 50% of the walk had dirt trials), making it a tough walk, it still had the feeling of being nearly finished. My enthusiasm was high. As the walk started, however, I discovered my energy was low. I was just exhousted from the two days before. That seemed to be the energy with the other walkers, yet we marched on. There did not seem to be as much talking … just focus on walking. I did not see Jody & Lynn that morning so I walked alone. I missed them. On occasion I would strike up a conversation with another walker … briefly, but mostly I took this day alone. We walked from the camp at the Presidio, towards the panhandle of the park. I sent a text message to my friend that lived there, but did not get a reply until after we had passed. We walked down Height Street and up the hill, half way up Twin Peaks. I kept wondering if they were going to take us up there, but we turned down the hill towards the Castro. This was a difficult stretch going downhill on the concrete. My feet were pounding. We went through the Castro and wound our way through Noe Valley, getting ever so close to my old neighborhood that I had just moved out of 3 weeks prior. I sent a text message to my friend nearby, but did not receive a reply until we had passed. Lunch was at mile 10, leaving only 4 miles to go on the day … on the entire event. The excitement of being finished began to overpower everything else, the pain as well as the desire to eat and drink. I spent only 15 minutes at lunch. I did not change out my socks and moleskin like I did at lunch the days before. Who cared if I got blisters now? The days ahead I would be home relaxing! After lunch I continued on with my pre lunch gait that I had adopted the previous days … maybe even a little faster. I completely skipped the next (and last) pit stop. We crossed Market Street passed Geary and wound our way through Japan Town before turning towards the Civic Center where the event would end. This last stretch was all downhill. My excitement was so great that if we were allowed to run I would have been. Instead I was walking at a pace just below jogging. I kept reminding myself the difference between running and waling. In walking there is always at least one foot touching the ground. In running, or jogging, there are points where both feet are off the ground. I was focusing on going as fast as I could while keeping one foot always on the ground … a walker! I was passing other walkers left and right as we passed the City Hall and turned the corner. I could see the finishing line. I was not going fast enough, but as fast as I could. I drew nearer and could hear the cheering. There was a chute of human volunteers leading me into the finishing coral, all cheering for me and giving high fives, I was a bit emotional as I told them, “If were allowed to run I would be.” I made my way into the chute and finished! I looked around, the place was empty, but for a few walkers and the volunteer staff. “Where is everyone?” I thought. I was one of the first ones to finish. I had 3 hours to kill before the closing ceremony. I drank some water and Gatorade and ate a few snacks before heading back up the course a few blocks where I would spend the next two hours cheering the other walkers as they came in, sometimes shedding tears of joy with them having finished such an event. So I met some friends, heard some stories and challenged myself. I raised some money that will hopefully do some good. It’s a small dent in the overall awareness and progress against this disease through our western paradigm. I believe in progress. I believe in a time that paradigms will come together and the world can be free of, not just this disease, but also all. This entry was posted in What Happened on June 26, 2013 by jligda. Photos taken while walking across the Golden Gate Bridge for a training walk for the Susan G Komen 3-Day walk. 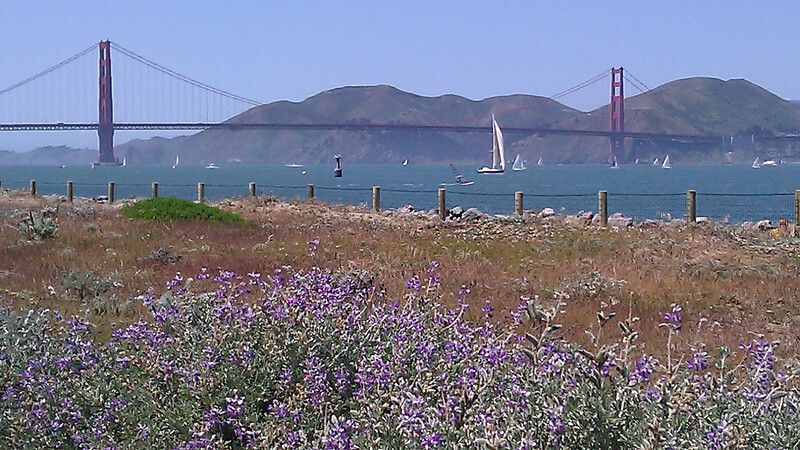 The walk was from South End Rowing Club, across the Golden Gate Bridge and back. 14 miles total. This entry was posted in Landscapes on April 21, 2013 by jligda. This entry was posted in Swimming and tagged Swimming on March 24, 2013 by jligda. This entry was posted in Swimming and tagged Swimming on February 24, 2013 by jligda. This entry was posted in Video and tagged Giants, Video on October 31, 2012 by jligda. 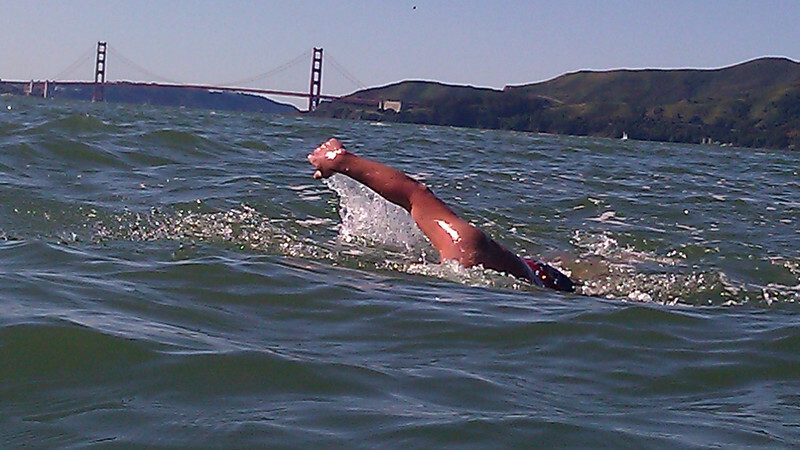 Kirk did the butterfly out to Alcatraz and back. 3 1/2 hours. The original plan was to go out, around Alcatraz and back, but the ebb current was too strong to allow Kirk to swim around the back of the island. He reached the island at the southwest end. He swam around the the southeast side attempting to make the turn around the back, however the current at the corner was too strong for his swim speed doing the butterfly. He settled for a touch and go and headed back to the city front. This entry was posted in Video and tagged Swimming, Video on October 21, 2012 by jligda. It was quite a challenge piloting Stephanie into Raccoon Strait from Red Rock in that 4.6 knot ebb: http://jay2.ligda.net/tide_graph.asp?tsid=91420. We have to cross two miles of channel before the current carries us two mile down the channel passed to opening to Raccoon Strait. Stephanie had a tendency to pull a little to the left. As I keep the kayak in line towards the sighting goal she would veer off, getting further to the left of me. I thought this was OK. I was being ultra conservative with the line, trying to get across the channel first and then swimming with the current along Tiburon into Raccoon Strait, so her veering a little would probably still get us there. I’m never 100% sure about these things. As we were making progress across the channel I would update Stephanie on a sighting target from time to time as the current carried us passed the last one. At one point Stephanie made the comment, “I wish I were a faster swimmer so I could swim with the current. I hate always having to swim across it.” The faster swimmers were able to make take more of an angle with the current as they would spend less time getting across, and therefor be less affected by it. I told Stephanie I understood, as I am a slower swimmer as well. She swam on. There were three other swimmers near us. Melissa was with her brother, Teo, in the kayak. There were further north that us, making a more conservative line. Joseph and Denys were with kayaker, Rhonda. They were south of us, taking a more direct line. We were all about even as far as distance across the channel. Up ahead I could see more swimmers in the distance, far to the south and closer to the strait. It is hard to tell how they were doing from such a distance. I could hear the lead swimmers pilot on the radio commenting about how far from the point on the north side of the strait they should stay to avoid the back eddy there. I chuckled t myself. That is something we will not have to worry about … if we make it into the strait at all it will not be on the north end. As we drew nearer I was never really sure if we were on target or not. About half the time I thought we were, the other half I thought we were going to miss. Eventually we were close enough to have a good view of Point Campbell on Angel Island. This is where the current will split around the island. We wanted to be past Point Campbell in the current that will sweep into Raccoon Strait. Otherwise we would be swept around the east side of the island. We still had a ways to go to be passed that point. I kept an eye on the swimmers that were way ahead to see how they were being pushed. They appeared to be in the correct line of current and were being carried to the south side of the strait. I looked over at Rhonda and her swimmers. The distance between us was becoming greater. If I had a question about whether we would make it, I did not think they would make it at all. I envied Teo and Melissa to the north. They had a much better line, which was soon to be confirmed as we made the final approach. Finally the current has pushed us passed the north side of the strait. I could see the houses along that shore, however we were still not passed Point Campbell, therefor still in the current that was sweeping us along the east side. Not good! Teo & Melissa were suddenly ahead of us. Taking the better route, they were in the correct current stream, which just carried them on into the strait ahead of us. I began to worry for us. The opening is about 3/4 of a mile, but that distance can go quick with a strong current. I knew we had to get across that current line as quick as possible. But I also knew we were close. I got Stephanie’s attention and instructed her to power as hard as she could for about 5 minutes towards those houses on the north shore. I could tell she was a little frustrated. She wanted to be swimming with the current rather than fighting it. Once we crossed that line, however, she would be. It was a little taste of heaven once we cleared it. “You’re OK now,” I told her. We stopped and she fed. The current was now carrying us towards Ayala Cove, inside the strait. Teo & Melissa were still ahead of us, but no longer pulling away. Rhonda and her swimmers … well it looked like they were getting pushed passed the opening. Later I heard Scotty on the radio to her, “Get your swimmers in close to shore.” They were on the island side, passed the opening fighting the current trying to get back in. Within a few minutes they decided to swim into the beach, call it quits for the day, take photos, and get back in the boat, both happy with their accomplishment that day. The current inside Raccoon Strait is a giant “S” when ebbing. It comes into the strait from the north and pushes across to Ayala Cove. It then bounces off the island and shoots across to the north to Belvedere Cove in Tiburon, where Sam’s Restaurant is (it’s a pretty good bet that those two coves were carved out by the currents over time). Then it bounces off Tiburon out passed Angel Island, into the middle of the bay and eventually out the Gate. Stephanie and I swam with the current to Ayala Cove. The water started getting choppy as it was reflecting off the island. Stephanie said she wanted to swim out into the channel a little more to get out of the chop. I almost told her not to, to just let the current take her ther, but I let her go. I’m never 100% sure, myself, so I let her do what she thought was best. After a little while swimming with the current I commented to Stephanie, “See how far in the middle we are now?” The current was carrying us to Sam’s. We were still pretty far from it, but were getting close to it faster. With that, were were starting to get back into another “danger” zone of being swept passed the island. We wanted to turn right at the end of the island to make it to the west side, Red Buoy #2. However, were so far north of the island now that by the time we would catch the current bouncing off Sam’s that the current would also have carried us too far west passed the island. This is indeed what happened. We watch the island getting further away with no way to really fight the current to get back to it. “We are going to the Golden Gate Bridge,” I joked with her. At this point the Dauntless was nearby picking up Melissa, who was still ahead of us, but on a better line for the island. Stephanie told me she was done for the day. I let the Dauntless know. It was 1/4 of a mile away opposite the current. Stephanie had to swim against the current to get there. The Dauntless, however, was drifting with the current towards her. She was tired and would have rather not made that last effort, but what can a swimmer do, when the boat is way over there! 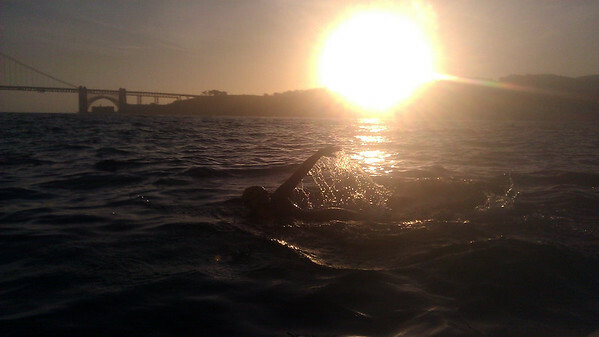 This entry was posted in What Happened and tagged Swimming on July 8, 2012 by jligda.